LuLupu turns 1 this month and we are all happy and celebrating! I had been a DT at Lulupu for almost a year.. since Lulupu was just an idea and now when I see how far its come its only overwhelms me with joy! I must say it was an awesome journey. I had a ball of time! I not only got to learn a lot of new things but also made some really good friends. It wish Lulupu a lot more success in the coming years. March will be going to be fun at Lulupu – The Craft Lounge! There will be many giveaways and tonnes of fun so do ensure you follows Lulupu all around FB, Twitter, Pinterest and Youtube! To kick start the celebration we have a Lulupu Design Team Blog Hop along with the monthly challenge. So if you have landed at this post just now, you can start HERE and join us in this fun filled week! So here I am sharing my project for Lulupu Challenge #10 – Let’s Celebrate. As the challenge suggests, we were to take inspiration from a fellow Design Team member and create a project that celebrates…. well… just about anything. My inspiration was Tejal’s Butterfly card. I love how Tejal uses butterflies in most of her projects. I too am a big fan of butterflies like Tejal and so I decided to go with this pretty card! I love how she had layered the cards and the have those pretty fluttery beauties pop from the punched circles. I know its gifficult to match up with Tejal’s embossing skill yet I decided to take a plunge and go for it.. So here is my take on it.. I decided to use the same template! 🙂 The base is a plain white cardstock and the pattern papers are from the Die Cut’s With a View’s Street Lace Paper stack. The butterflies were heat embossed using white embossing powder on vellum! Now continue the Lulupu Design Team Blog Hop with the Tejal tomorrow on 8th March. Also here is the list to help you track the blog hop ending on 9th March. wow , both the cards are beautiful.vellum butterfly is my beyond imagination ..wanna study more about vellum ,but your card is very beautiful.nice hopping with you all. The butterflies are very pretty!! I do not know much about vellum.. have to google 😀 Thanks for sharing!! beautiful card and awsum butterflies all fluttering around…. wow …just loved the vellum butterflies…so neatly embossed…beautiful.thanks for sharing happiness n giving us a chance to being a part o lulupus celebration. Lovely cards,both the inspiration amd your take on it.vellum looks really cool.you have a nice blog.WOnder why I never visited earlier! Pretty vellum butterflies and neat sketch…Love it! Lovely card. Great embossing on the vellum, those butterflies look awesome! Wow ! I loved your take on Tejal’s card ! The vellum butterflies are awesome and I liked your choice of pps ! Your card looks just gorgeous..!! Beautiful card dear! even m addicted to use butterflies in most of my projects 🙂 But I never tried with embossing….u surely inspired me to try a one!Hugs! Love the embossed butterfly on vellum..great card !! Love the embossed butterflies on vellum…great card !! Gorgeous gorgeous flutterflies….Aren’t they amazing..I never stop loving them!! Mucho hugs girlie!! 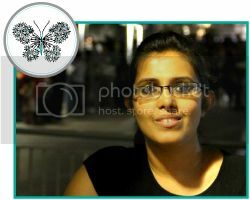 Hi Shruti,Awesome work, i m flattered by your work. Its great Shruti. Butterflies can never go wrong. Beautiful. Pretty card ..I love the border punches and butterflies..